This is the third book featuring the sassy P.I. by the name of Kat Stone who first appeared in “The Red Chameleon.” Readers fell for Stone quickly, which is not a shock, considering the smart mouth, quick wit and endless wigs she owns. But this time around, this well-intentioned P.I. may have to shed her disguises, which could lead her into far more harrowing positions. Kat is already spending life looking over her shoulder. With a past of violence that she’s tried to get away from, Kat knows that the time she has left on this planet may just come to an end quicker than she wants. But being a P.I. is something she’s extremely good at, and she soon finds herself buried in a case that may bring her face to face with yet another cold-blooded killer. Walking in Fort Washington Park, Kat stumbles across a familiar corpse. It is the body of her maintenance man that works in the building where she resides. It seems that the man took a leap off the bridge and ended up smashing down on top of a lighthouse. Although the police dismiss it quickly as just another suicide, Kat smells something fishy and begins to dig deeper. She soon finds out that the man was locating employment for immigrants, which can turn into a dangerous sideline if you step on any of the wrong toes. 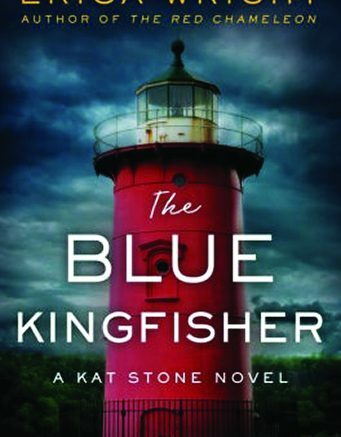 With her investigation in high gear, the wigs come back out as Kat goes undercover, working at a deep-sea fishing company in an attempt to find out who murdered the maintenance man. Wright offers up a cast of unforgettable characters (including jellyfish, of all things), and creates a page turner. The clock is truly ticking as readers “run” along beside Kat to see if she can solve this investigation…or if her own past will resurface to take her down before justice can be done. 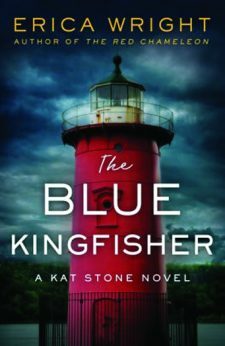 Be the first to comment on "“The Blue Kingfisher” by Erica Wright"